Will Sunday’s Gent-Wevelgem end in a bunch sprint, a solo move, or a small gallop to the line? Three factors often impact the outcome of the 251km race, which includes three climbs up the feared Kemmelberg climb. The route between Deinze and Wevelgem features 10 steep cobbled climbs, which always split up the field throughout the day. 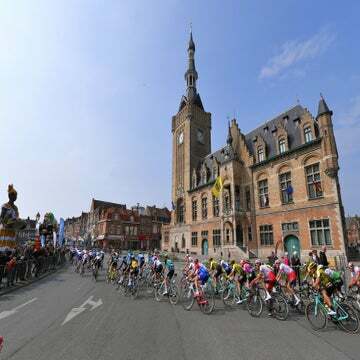 The race is also infamous for gusting winds and rain that blow in off of the North Sea; foul conditions often rip the field into small groups and give an advantage to breakaways. And then, Gent-Wevelgem’s final flat 35km gives the peloton and sprinters one final chance to bring everything back together. Right now, various weather services are predicting light rain and steady winds for West Flanders on Sunday. These conditions could favor a small group or even a solo victory. With these conditions in mind, who are the five riders that we think have the best shot to win? Naesen is on top form this spring — a fact proved by his second-place finish at Milano-Sanremo last weekend. Such form could help Naesen finally break through at the cobbled classics, where he’s been a nearly man for several years now. Naesen’s Ag2r squad has a pedigree at these races, with Stijn Vandenbergh and Silvan Dillier, which could help him navigate the challenging tactics present in a wet and wild Gent-Wevelgem. Whether Naesen has the legs to finish it off is a big question. Cycling fans undoubtedly recall the sight of Viviani crying tears of disappointment after his near miss at the 2018 edition of this race. He’s back this year and on equally as good form—the Italian already owns four victories this season. His third-place finish at Driedaagse Brugge-De Panne is a sign that he may be a step behind Dylan Groenewegen (Jumbo-Visma) in bunch sprints. Yet Viviani is more versatile than Groenewegen in hilly terrain, and if he loses ground on the Kemmelberg, he has the strongest team in the bunch to tow him back to the lead group. The big question with Viviani is whether the rainy, slippery conditions will slow him on the climbs. Should he lose ground, Deceuninck-Quick-Step will look to Zdenek Stybar, Yves Lampaert, or Philippe Gilbert for the win. Never count out Peter Sagan at Gent-Wevelgem, even if he’s not on his best form. The defending champion is perhaps a few watts behind where he normally is at this time of year due to a stomach virus he suffered prior to Tirreno-Adriatico. But Sagan has more victories (3) at Gent-Wevelgem than any active rider, and that experience and confidence alone can overcome whatever form he is missing. Plus, the pressure around the classics always motivates Sagan to achieve great things, and his Bora-Hansgrohe team is comprised entirely of cobblestone veterans. Sagan made the front group at Milano-Sanremo, a sign that he is finding his legs. The question is whether he has the sprint to finish things off. Van Avermaet’s disappointing classics campaign thus far nearly convinced us to leave him off of this list. He was a non-factor at Milano-Sanremo and lacked the legs to follow the winning move at Strade Bianche. Yet the decidedly Flandrien conditions slated for Sunday mean Golden Greg has more than a good chance to win. His CCC team is rife with classics talent. He’s one of the best in the world at riding over wet, slippery cobblestones. And Van Avermaet’s dismal spring means the pressure is on him to deliver at these cobbled races. The last thing Van Avermaet wants is to leave cycling’s Holy Week without a result. We originally had Jumbo-Visma’s sprinter Dylan Groenewegen on this list, as the Dutch sprinter is the fastest finisher on the start list. But the rainy forecast changed our minds, and we’ve chosen the team’s up-and-coming hardman, Wout van Aert, instead. Van Aert may be a few years removed from a big classics victory under normal conditions. However, a wet and wild day at Gent-Wevelgem could give him an important advantage. Van Aert is on decidedly good form this spring — he was third at Strade Bianche and sixth at Milano-Sanremo. Those strong legs, when matched with Van Aert’s handling skills from cyclocross, make him a true danger man on the cobblestones.